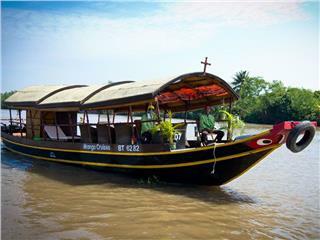 As being one of the most favorite cruises in Mekong River, Mekong Queen Sampan provides passengers various day cruises to famous attractions in Mekong River Delta. With rate from 63 USD per passenger par day, you will enjoy great time with the cruise. 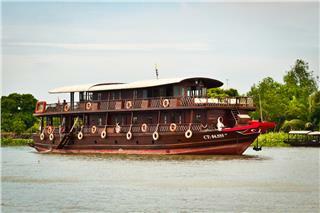 Cai Be Princess Sampan is one of very few private superior cruises in Mekong River. This is a great choice for those who desire to explore life and culture in Mekong River by a local sampan with traditional style and ultimate privacy. With just from 89USD per day on Mango Day Cruise, you will have chance to contemplate the amazing scenes of Mekong River from Saigon to Ben Tre. In addition, you have a chance to have experience on homestay at a local house. 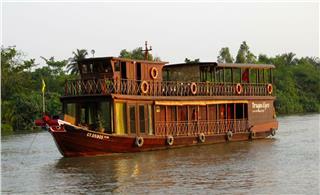 Mekong Melody Cruise is one of superior cruises in Mekong River. 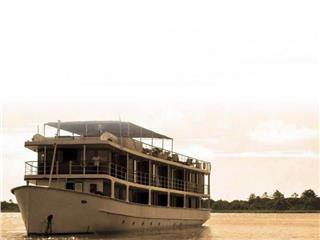 Having only two cabins, Mekong Melody is designed to provide you the most private space, therefore, this cruise is pretty suitable for couples, honeymooners, or individuals. 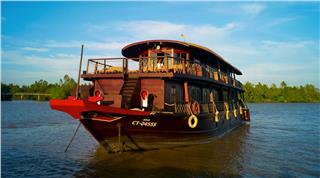 Douce Mekong Cruise with traditional designed barge possesses four deluxe cabins equipped with modern amenities is your great choice for a Mekong tour. 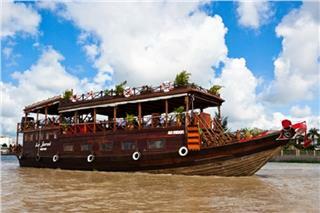 The Mekong cruise will provide passengers with high-standard and enthusiastic attentiveness. Among superior cruises in Mekong River, Gecko Eyes Cruise, is always a good choice for you with reasonable price, good services, and different itineraries. 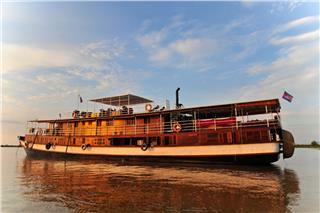 With Gecko Eyes Cruise, you will experience an individual cruise in Mekong River. 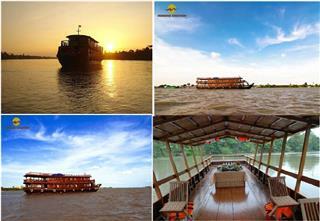 Mekong Emotion Cruise is one of the newest superior cruises in Mekong River. The cruise will bring the best services and unforgettable memories to you. 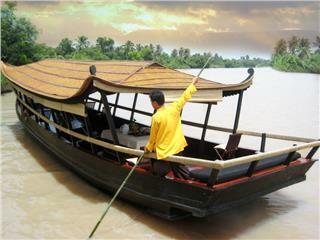 With merely from 100 USD, you can discover a great number of things about Mekong River. 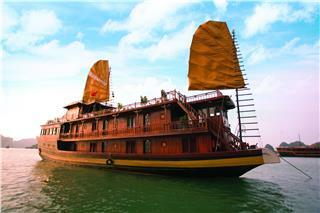 Mien Tay Sampan Cruise is designed in the style of traditional sampans. Having 5 cabins, 1 ventilated compartment which could be used as a dinner room as well as bedroom, and available couchettes, the sampan can accommodate from 2 - 16 people. Owning airy cabins and capacious dining area with comfortable couchettes, Authentic Mekong Cruise promises to bring best-quality services to passengers. 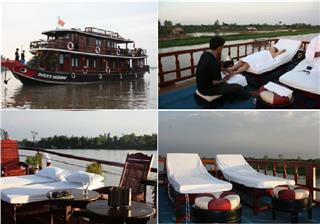 With an affordable rate, you can definitely enjoy unforgettable moments on Mekong River. 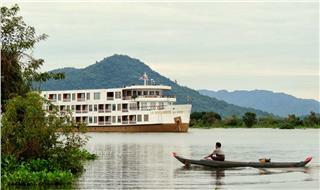 Mekong Eyes River Cruise is one of top choices for Mekong River superior cruises. The cruise was built from the finest-quality wood combining regional style and modern comfort and tastefully decorated by skillful craftsmen of Mekong River. Being one of the best deluxe day cruises in Mekong River, Le Jarai Cruise will bring the best services to you during cruise tours to Mekong River Delta. With attractive special offers and incentives, the cruise will definitely satisfy you. 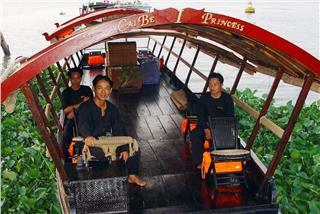 A flotilla of four unique sampans named Song Xanh was designed to serve those who are seeking for a private Mekong cruise. Song Xanh Sampans are very suitable for individuals or couples who want to have a private space in the relaxing atmosphere. RV Lan Diep Cruise, one of the best deluxe cruises in Mekong River, offers the best services during your holiday from Saigon to Siem Reap and vice versa. Being outfitted with 22 deluxe cabins, the cruise is a good choice for couples and families. L’Amant Cruise is among Mekong River deluxe cruises, which is traditionally decorated with lustrous brass and carved wood and outfitted with discreetly and refined modern comfort, which promises to bring you a a remarkable voyage in Mekong River. Le Cochinchine Cruise is a superior cruise. It is furnished with modern amenities in 10 deluxe cabins. With an affordable rate, you will be definitely satisfied with all services of the cruise from accommodation to activities and recreation. With only from 200USD for two days of traveling around Mekong River Delta in Vietnam, tourists can have a chance to catch a glimpse of the immense river. 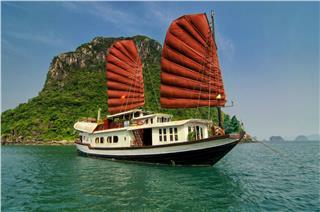 Enjoying on Bassac Cruise will bring unforgettable memories in your vacation in Vietnam. 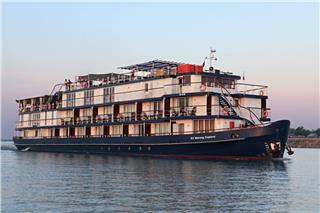 Toum Tiou Cruise has two deluxe-type ships. 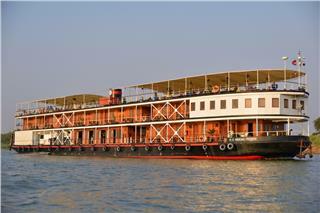 With colonial style design, Toum Tiou Cruise is outfitted with over 10 opulent and cozy cabins. They are equipped with contemporary amenities, high-quality services and enthusiastic staff. Residing in one of 24 spacious cabins of RV Indochina Cruise, you will have a chance to first hand observe Mekong River daily life, enjoy the mixture of Asian and Western cuisine, and take part in many sightseeing programs. 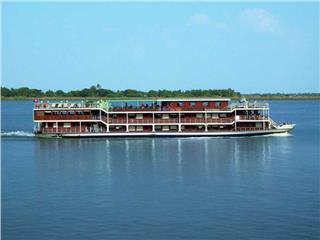 The Dragon Eyes River Cruise is among Mekong River deluxe cruises with 2 sister vessels numbered Dragon Eyes I and Dragon Eyes II. 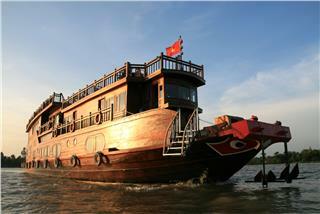 Dragon Eyes was built following traditional style of Mekong cruise by local skilled craftsmen. 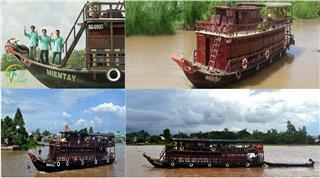 Jayavarman Cruise is one of the best luxury cruises in Mekong River. This cruise is a perfect choice for families, couples, honeymooners who desire to experience luxury cruise and admire beautiful sceneries in Mekong River in Vietnam and Cambodia. 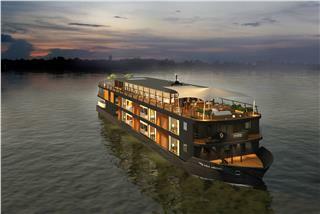 Aqua Mekong River Cruise is one of the newest luxury cruises in Mekong River. The cruise is suitable for those who desire to explore spectacular sceneries and visit cultural sites of Vietnam and Cambodia such as Catholic churches, Buddhist temples, etc. 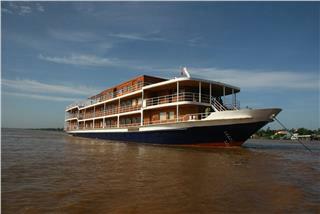 RV La Marguerite Cruise is a luxury cruise in Mekong River. The opulent cruise ship has a colonial and boutique design. 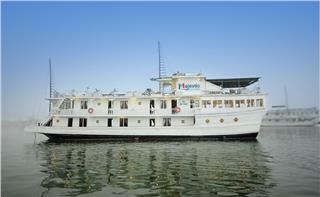 It is outfitted with 46 sumptuous cabins, spacious balconies, modern amenities, and high-quality services. 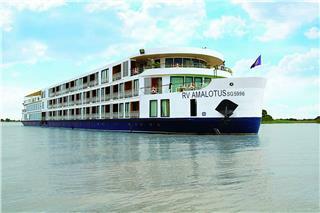 Amalotus Cruise is a top Mekong cruise which offers passengers 62 spacious cabins for comfortably relaxing. With the passenger’s capacity of 124 people, Amalotus Cruise is one of your best choice in terms of luxury cruises in Mekong River. Until 2014, Irrawaddy Flotilla Company has operating 12 beautiful crafted ships named Pandaw Cruise, which made from brass and teak by traditional craftsmen. 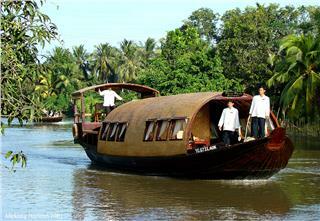 All are capable to bring tourists to remote areas of Asia including Vietnam, Cambodia, and Burma. 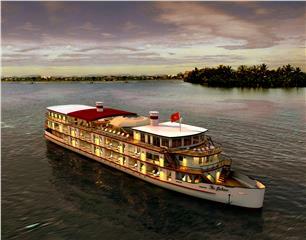 RV Mekong Prestige Cruise is a five-star vessel equipped with modern and luxury facilities and amenities. The cruise provides outstanding services in fitness room, indoor lounge bar, spacious dining hall and comfortable cabins. Jahan Cruise fascinates passengers by its outstanding decorative patterns of India in the combination with British colonial style. 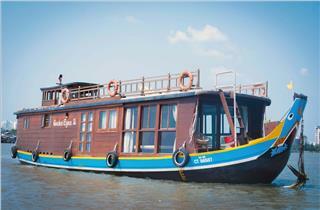 Possessing 26 luxurious cabins, the Jahan also provides services of club, bar, spa, sauna, and other activities. Being known as one of five members in a Royal family of Indochina Junks, Prince Junks promises bring passengers a life time experience in Halong Bay with friendly staffs, unique services, and fantastic foods with special diet cares. If you are wondering about a good day cruise for a spectacular voyage in Halong Bay, Image Halong Cruise is a reasonable choice. With the capacity of 48 people, these cruises outfit with spacious sundeck for a panoramic view in the world heritage site. Travelling with Canary Cruise, you can take part in very interesting excursions and activities in Halong Bay such as joining in Sunset party or cooking class, climbing to amazing island, swimming or kayaking in very crystal water, and so on. 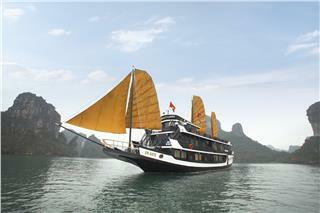 Golden Lotus Cruise, one of superior cruises in Halong Bay, is built in traditional and elegant style. With a motto of “Live your nautical dreams”, Golden Lotus Cruise has a strong desire to bring its passengers interesting experience in Halong Bay. 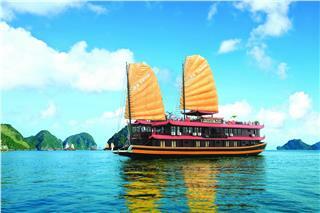 Poseidon Sails are defined as one of superior cruises in Halong Bay. Choosing Poseidon Sails as your companion, you can attend in a great deal of activities such as trekking in Cat Ba National Park, overnight in Monkey Island resort, and so on. 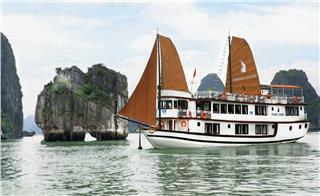 With 13 superior boats, Bai Tho Junk is one of the best mid-range cruises in Halong Bay. All cabins in these junks are furnished with modern amenities and cozy decoration. Apart from enjoying relaxing moment on board, guests join interesting activities. 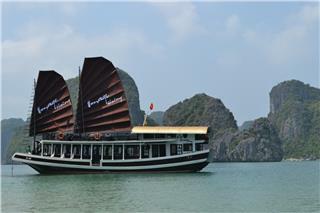 Phoenix Cruise Halong is a superior cruise in Halong Bay. This budget cruise is an ideal choice for travel groups, couples, and families to enjoy unforgettable voyages with full of best services. 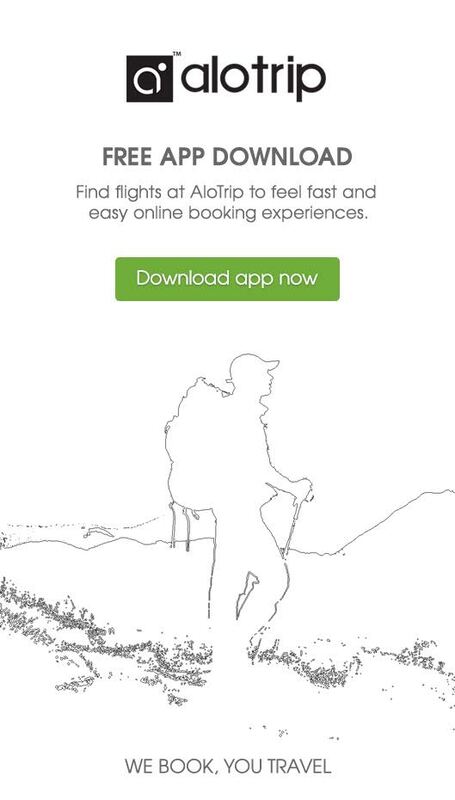 With about 200USD, passengers can have a wonderful trip. V’spirit is an abbreviation for Vietnamese spirit. With this name, V’spirit Cruise desires to bring its clients best aspects of a classic and comfortable cruise in Halong Bay and continues reflecting current lifestyles and spirits of Vietnamese people. 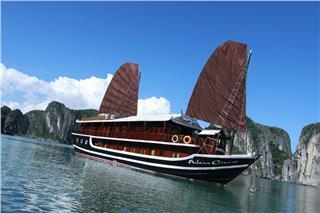 Aclass Cruise is favored by a large number of tourists when visiting Halong Bay. The budget cruise is an ideal choice for couples, families, and groups of friends to enjoy wonderful summer vacation in the bay. The cruise provides you with best services. 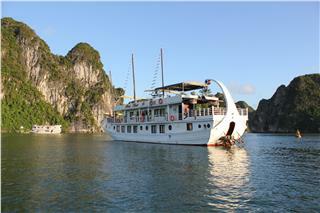 Majestic Cruise is one of Halong Bay superior cruises. Spreading over 3 decks, Majestic Cruise has 12 deluxe suites providing boutique interiors with oak-wooden wall and having sea view and balcony in to spectacular Halong Bay. 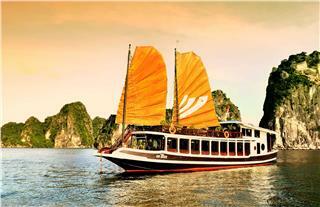 Bai Tu Long Junk is one of the most favorite budget cruises in Halong Bay. Having design of traditional Chinese junks in the combination with Vietnamese style and contemporary amenities, Bai Tu Long Junk is an ideal choice for tourists in Halong travel. 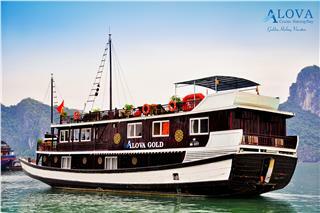 Alova Gold Cruises is one of superior cruises in Halong Bay. With an objective of offering travelers a private space, Alova Gold Cruise limits numbers of rooms to ensure that travelers will not be disturbed by lots of passengers. 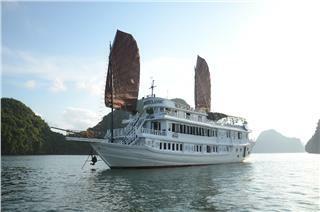 Royal Heritage Cruise is one of the most favorite cruises in Halong Bay. This cruise possesses 9 cabins outfitted with modern amenities and splendid design. 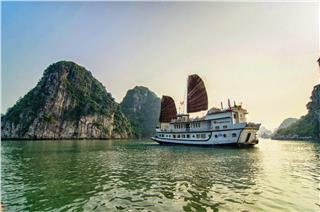 Enjoying your Halong vacation with the cruise will be an unforgettable memory in your life. 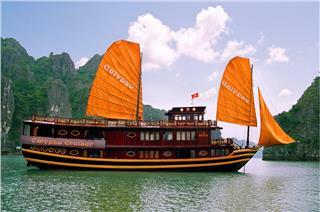 Marguerite Garden Cruise is one among superior cruises in Halong Bay. 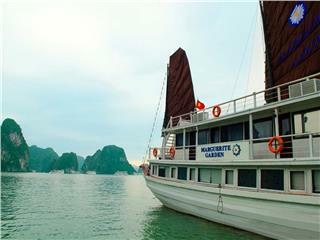 Possessing 10 cabins which are beautifully decorated, Marguerite Garden Cruise will bring a great itinerary for swimming, kayaking, and visiting pristine seascapes of Halong Bay. Being made from finest natural materials including precious dark wood, creamy silk, crispy whiten linen, sea-blue taffeta, fine texture marble, and silver accessories, Classic Sail Cruise is a blend of contemporary comforts and Vietnam traditional design. 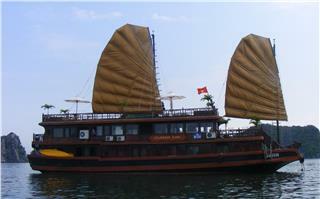 Oriental Sails are designed in ancient Vietnamese style. 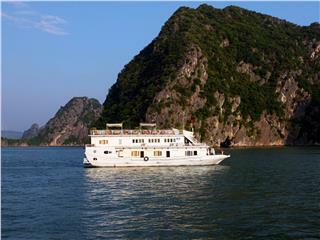 These cruises are equipped with wooden and rattan furnishings, many windows for stunning views into Halong Bay, and a panoramic sundeck for different activities onboard. Having wooden oriental design, Marguerite Junks are built from special wood in a hull of Xyliaxyocarpa and Fokienia hodginsii. With Marguerite Junks, travelers will experience genuinely friendly, genuinely reliable, and genuinely professional services. With an objective of providing a soothing and stimulating trip in Halong Bay that makes passengers remember and cherish, Glory Cruise always receives great feedbacks from clients who already experienced Glory Cruise’s services. 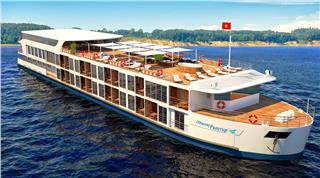 Phoenix Luxury Cruise has 10 deluxe cabins in contemporary style. This cruise does not just provide passengers with romantic and wonderful views of Halong Bay, but also offers the best services along with comfort and tranquility. As one of deluxe cruises in Halong Bay, Syrena Cruises always pay attention to details and strive to meet all expectations of passengers about an exceptional cruise. 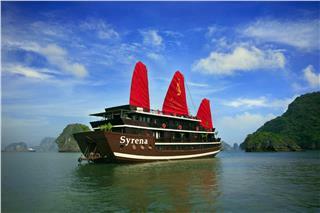 With Syrena Cruises, tourists will have a feeling of true indulgence in Halong Bay. 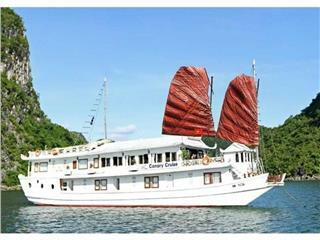 Being designed in traditional wooden style in the combination with modern amenities, Calypso Cruise is regarded as one of ideal options for Halong Bay tours. Passengers are not just served with high quality, but also the most attentiveness. 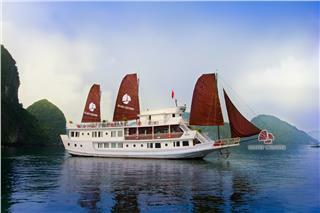 Among deluxe cruises in Halong Bay, Carina Cruise is the most intimate junks with 9 luxury en-suite cabins. This cruise carters couples, individuals, families, or small groups who are seeking a cozy and private cruise to travel in Halong. 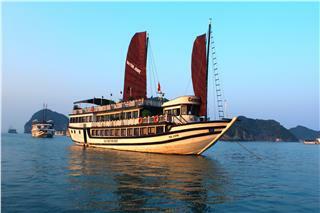 Having a fleet of eight deluxe junks, Bhaya Legend Cruise is one of the most favorite cruises in Halong Bay. Being designed in a traditional style in the harmony with modern facilities and services. Passengers will have unforgettable trip with the cruise. Being designed after an authentic Chinese Junk, Red Dragon Cruise features with 5 deluxe cabins, 2 upper luxury dining areas, and 2 spacious sundecks and relaxation. 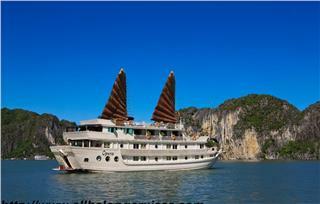 With these facilities, this Cruise is an excellent companion of tourists in Halong Bay. 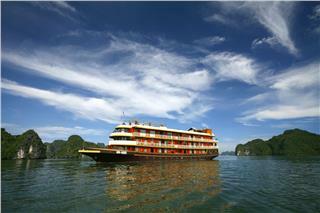 Being furnished with modern and luxury cabins, Glory Premium is one of the best deluxe cruises in Halong Bay. Glory Premium Cruise is a perfect choice for families or groups of friends. The junk will bring the best services and comfort to you. Aclass Opera Cruise has been operating to bring tourists the best value and sense in every amenity and service. 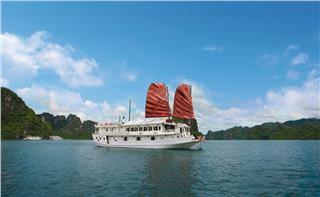 With a motto of “leave your worries behind”, tourists can be truly relax when travelling in Halong Bay with this cruise. 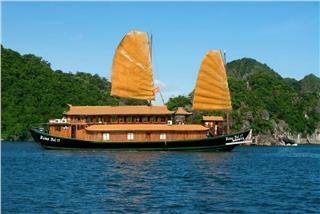 Huong Hai Junk is one of the most outstanding deluxe cruises in Halong Bay. With a fleet of eight junks designed in both traditional Vietnamese and Chinese styles, Huong Hai Junk will bring all best services and comfort to passengers. Taking the inspiration from 1910’s Indochina style, Emotion Cruise is a perfect combination between traditional elegance and modern comfort. 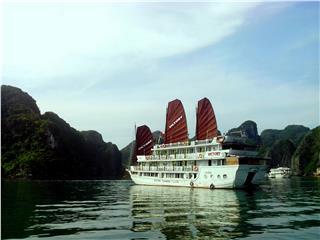 The cruise will bring passengers an emotional cruise in Halong Bay as it name implies. 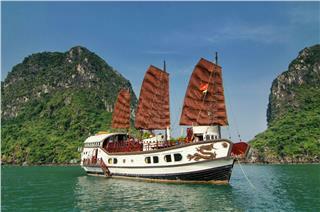 Dragon Pearl Junk with 11 deluxe cabins will be a great choice for travel group. 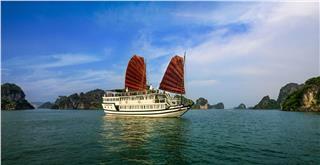 Being launched in 2010, three junks of Dragon Pearl are among the latest cruises in Halong Bay. 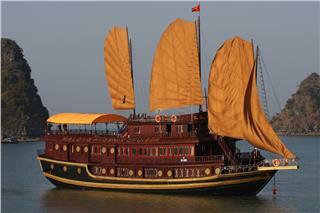 These Chinese style junks are equipped with modern amenities. With 2 types of boats, a fleet of Victory Cruises can meet different demands of guests. While Victory Cruises 21 cabins is spacious and can accommodate 42 passengers, Private Victory is suitable for family charter with maximum of 5 people per vessel.